Illustrates the capture of Mexico City by the U.S. Army and Marines during the Mexican-American War. Battles of Mexico, Line of Operations of the U.S. Army under the command of Major General Winfield Scott, on the 8th, 12th and 13th of September, 1847. 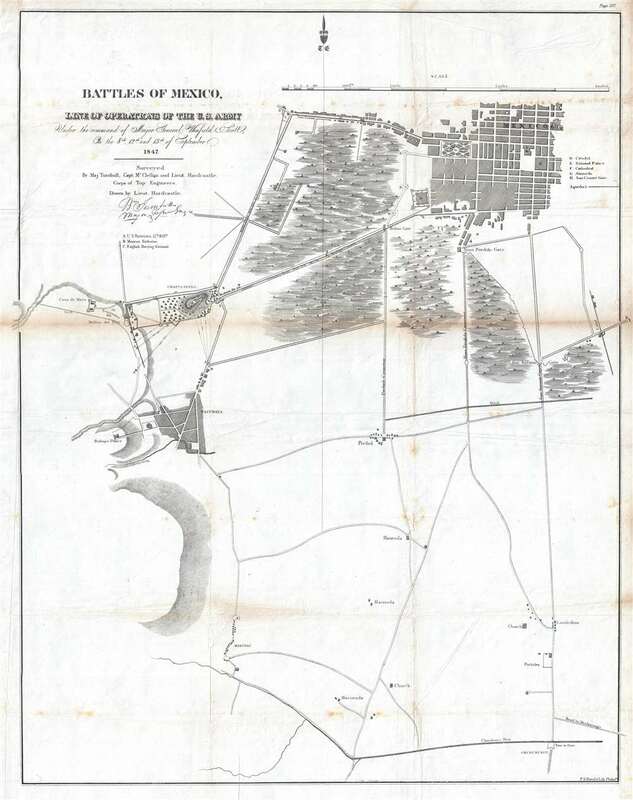 This is an 1847 Edmund Hardcastle map of the engagements that make up the Battle of Mexico City during the Mexican-American War. The map depicts the region from the Casa de Mata near the Molino del Rey to several sites of Mexican gun batteries to the east of the San Antonio Gate and from Mexico City itself to Churubusco. Led by General Winfield Scott, American forces executed an amphibious landing and captured the port of Veracruz. The army then marched across Mexico, winning victories at the Battle of Cerro Gordo and the Battle of Churubusco, which was located only five miles outside Mexico City. Numerous artillery batteries, both American and Mexican, are identified alphabetically and correspond to information provided in the key. The citadel, national palace, cathedral, and Alameda (Alameda Central) are also identified. After the U.S. army defeated the Mexicans at the Battle of Churubusco, General Scott set his eyes capturing Mexico City and ending the war. A series of engagements followed, which culminated in the fall of Mexico City. First, Scott believed that a Mexican cannon foundry was operating at the Molino del Rey. On September 8th, Scott ordered General William J. Worth and the 1st Division to take the Molino del Rey, which they did, though it produced no major military gains for the U.S. forces. The Battle of Chapultepec (a castle then located just outside Mexico City and guarding its western approaches) followed on September 12, when Scott ordered a day-long artillery barrage of the castle. The following day, September 13, General John Quitman let the 4th Division in an infantry assault on Chapultepec and easily captured the fortress. U.S. forces, under Generals Quitman and Worth, continued down the two causeways leading from Chapultepec into the city, although they were only supposed to feign an attack. Quitman faced resistance at the Belem Gate, while Worth and his troops fought defenders at the San Cosme Gate. Soon, Worth had broken through the defenses at the San Cosme Gate and marched into the Alameda at the center of Mexico City, which effectively ended the war. Very good. Toning along original fold lines. Foxing. Some creasing. Closed tear extending 1.5 inches from top border into printed area professionally repaired on verso. Blank on verso.